On the heels of their recent report of a surge in schools accepting their Gift of Play, Imagination Playground announced today even further growth in school opt-ins, pushing the total number of schools helped so far in 2016 to 411. This past week saw a total of 37 new schools enrolled in the program, surpassing last week’s record of 34. We just adore the Big Blue Blocks. They’re always the first piece of equipment we want to have and we didn’t want to open our new location without them, so thank you! 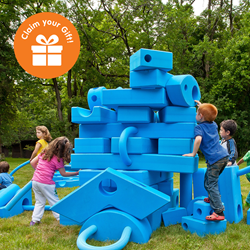 Gift of Play is Imagination Playground’s offer of financial help to bring a set of their well-known Big Blue Blocks to the many deserving schools that want the benefits of creative play for their children, but are struggling with budgetary constraints. The offer—recently increased to an unprecedented level—is a cash gift translating to 20% off a 105-piece Imagination Playground set, or, an Imagination Playground set of any size. According to Imagination Playground President Dave Krishock, Gift of Play is helping the company meet its 2016 goal to reach 3 million children, motivated by the global decline in creative play. The company reports having reached a total of 2,643,035 children so far this year. Among the schools that recently benefited from Gift of Play is O2B Kids, a group of Florida preschools offering creative play with Imagination Playground as part of their regular curriculum. Per Kristi McCray, School Director, Gift of Play enabled them to acquire a new Imagination Playground for the grand opening of their newest school in Altamonte Springs. Now, they are anxiously awaiting its arrival.